When humans finally travel to Mars, what will their first buildings look like? 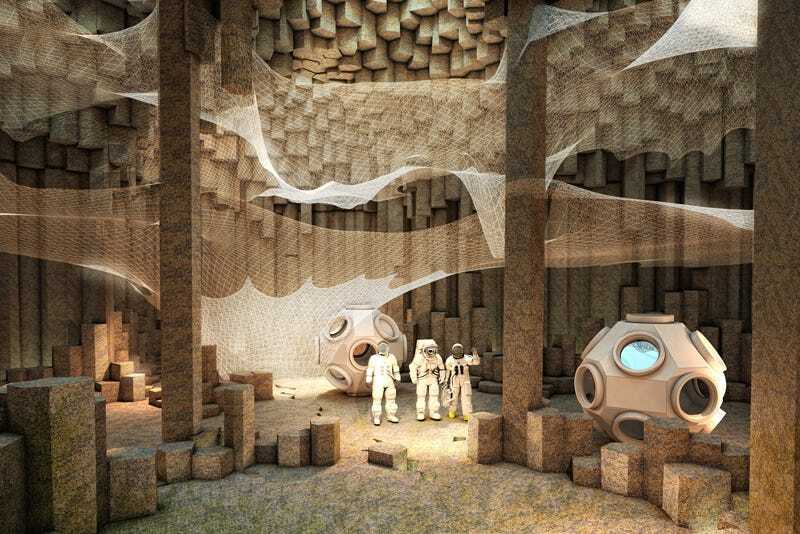 ZA Architects envision an underground colony with spiderweb floors spun from basalt fibers. ZA's proposal involves sending robots ahead of a human expedition to drill into the basalt-rich soil of Mars, creating caverns for underground human settlement. Human astronauts would then complete the construction. Skylights would sit at the surface, providing light for the human dwellers as well as feeding light into agricultural cavities. The caverns would have multiple levels, with the floors made out of basalt fibers, made by extruding molten basalt, and woven into netting by robots. In an interview with Dezeen, Arina Ageeva, one of the architects behind this proposal, acknowledges that the robotics they envision for the project don't currently exist, but Ageeva believes that it wouldn't be far-fetched to see robots capable of executing this project in the next decade.